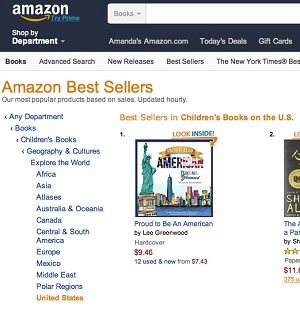 Lee Greenwood is taking the Amazon charts by leaps and bounds as a children’s book author following the release of his patriotic, fully-illustrated hardback, Proud To Be An American, over the Memorial Day weekend. Debuting at No. 1 on the “Movers and Shakers” chart and named one of Amazon’s top “Hot New Releases,” the book comes in as the No. 1 best-seller on both Amazon’s “Children’s Books On The U.S.” and “Children’s Multicultural Story Books” charts. As a father, Greenwood recalls reading to his own children when they were very small -- watching as they fervidly flipped through the pages and became captivated by all of the vivid photos and drawings.